Podiatric care at the Beaver Valley Foot Clinic has much surpassed the standards of foot treatment and attention. Not only do our services provide the best results from the most advanced technology, our skilled and experienced staff of Dr. Teimouri is also understanding and compassionate for every patient in need. And with so many different services available, from diabetic foot care and laser toe nail fungus removal, to x-rays and varicose vein treatments, you are sure to find good foot health at the Beaver Valley Foot Clinic. 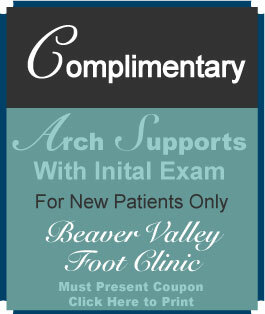 The Beaver Valley Foot Clinic has five dedicated locations in Pennsylvania for optimal convenience. The Cranberry Township clinic sits at 20555 on Route 19; the Chippewa Township clinic is located at 2226 Darlington Road; the Moon Township clinic is at 937 Beaver Grade Road; the Hopewell clinic location is on 2438 Brodhead Road; the clinic in Ambridge is located at 606 Merchant Street. No matter which location is most convenient for you to visit, each one provides the utmost best in podiatric care. For nearly twenty years Dr. Teimouri has been so devoted to the full care of her patients that she now also recruits additional support from individual experts, such as a leading in-house vein specialist. Treating varicose veins is a good step in the direction of prevention for lower extremity infections and complications. This is why the Beaver Valley Foot Clinic took the extra step to also become an accredited vascular laboratory. Not only does Dr. Teimouri recommend such specialists, she keeps them in-house to know for sure that her patients are receiving all the proper help they need. At Beaver Valley Foot Clinic, Dr. Teimouri and her team are dedicated to providing you with everything you need for optimal foot and associated health. Contact us today to schedule your next appointment at one of our locations, or for more information on Dr. Teimouri and her services. 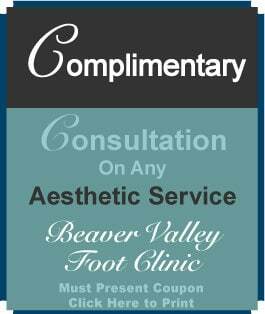 From advanced treatments to preventative measures, stay one step ahead with the Beaver Valley Foot Clinic.